STANDUP COMEDY PRESENTED BY WE ARE LIVE! 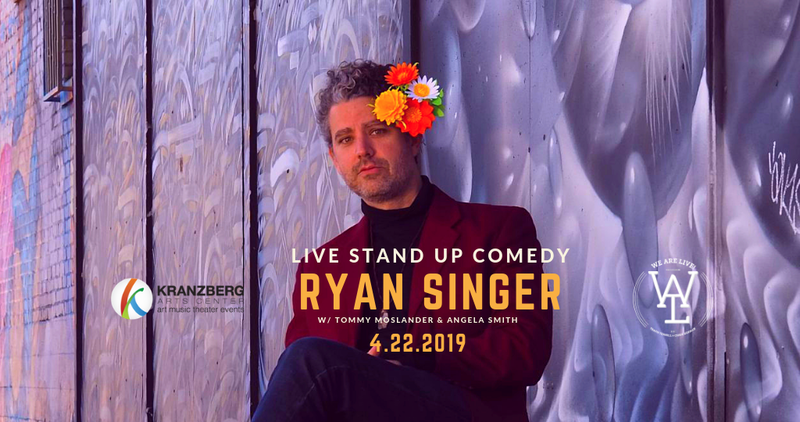 Comedian Ryan Singer one night only in Saint Louis, Missouri for a special live standup comedy event at The Kranzberg Arts Center Studio. Ryan will be joined by local comedians, Tommy Moslander and Angela Smith. Tickets available through MetroTix. $12 seats, $14 day of show. Ryan Singer is the epitome of a comic’s comic, all the while remaining accessible to mainstream audiences. He is unlike any other comedian working today – through stories of experiences in his own life, he dares to venture into the world of the esoteric, paranormal, and the mystical seeking ways to make us laugh at ourselves and understand our connectedness. At his core he operates from the viewpoint that, “It is more fun to believe,” and that shines through in his humble and head-on approach of confronting hefty topics and taking counter-culture stances. He beautifully takes the audience on a journey of the mind and through imagination to find the inspiringly funny. With an overall positive message in his material, Singer reminds us to re-embrace our intuition and go with our gut, all the while he’s trying to bust it. Ryan has released 4 full-length albums FREE LOVE, IMMORTAL FOR NOW, COMEDY WONDER TOWN & HOW TO GET HIGH WITHOUT DRUGS, was a recurring character as himself on IFC’s MARON, been seen on Seeso and is the creator and host of one of the top Science & Medicine podcasts on iTunes, ME & PARANORMAL YOU, conducting in-depth interviews with people who possess paranormal abilities or have had extraordinary experiences. His most recent album FREE LOVE was selected as one of the Top 10 Comedy Albums of 2018 by Vulture.com. He was selected by LA Weekly as one of “10 LA Comics to Watch” for 2014, was mentioned in NY Magazine as a “Comic to Watch,” was one of 4 finalists in the original CMT’s Next Big Comic Contest, is a frequent guest on the WTF Podcast w/Marc Maron and the Bob & Tom Show, and his joke “United Snacks of America” has over 9 million listens on Pandora.